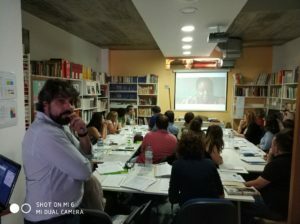 As part of the Decisions and Dilemmas 3: making learning about the EU motivating and meaningful project, the sixth national training event was held on the 29th of June, 2018 in Lisbon, at the headquarters of the Portuguese History Teachers Association (APH). The president of the APH Miguel Monteiro de Barros and Association Member Joaquim Carvalho prepared and implemented the workshops held in this event, with the participation of an international partner and trainer, the Association for Historical Dialogue and Research (AHDR) Educational Officer Loizos Loukaidis from Cyprus. The participants who attended this event were all teachers from different schools of the secondary level. Thirteen were from various locations around the country, and seven were from Lisbon where the training was held. The event began with Miguel Monteiro de Barros giving a summary of the project’s three phases and highlighting the importance of such a project and its beneficial implications for the integration of the EU. He stressed the importance of focusing more on social and daily life benefits brought by the EU, and less on political data such as treaties. He also informed the participants that amongst the materials provided to them, there was a pen drive that contained the three workshops discussed, in both Portuguese and English versions. This was followed by the start of the event’s first workshop “Comércio a uma escala global” (Trade in a global context) by Joaquim Carvalho. For this workshop, the participants worked in groups of four and at the end of the session, each group presented its conclusions. All the participants were adamant about the utility of this theme for their teaching practice. After lunch, Joaquim Carvalho presented the second workshop, which involved the use of drama: “Erguendo-se das ruínas” (Rising from ruins). The activity could not take place given the fact that the space available was not very adequate. Instead, the trainer presented the materials and explained how they could/should be used in a classroom context. After the presentation, there was a discussion about the material. Then, workshop three dealt with “Opening Europe’s borders”, given by the international partner and trainer Loizos Loukaidis. This workshop was given in English, as one of the prerequisites to attend this event was having knowledge of the English language. Again, the participants were divided into groups in order to discuss the material presented on a smaller scale. The participants found the activities very useful and engaging. The event ended with a presentation by Miguel Monteiro de Barros about Historiana. He demonstrated how units are grouped and how resources can be accessed through a hands-on activity. The participants were highly engaged in the activity. 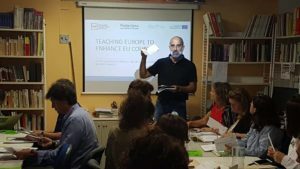 Reflecting on the event, participants expressed their genuine interest and determination to include the EU and its integration in their teaching practice. Miguel Monteiro de Barros informed that this project is already having an effect on the Portuguese curricula, as the APH is cooperating with teams from the Ministry of Education on a national project that deals with changing the way various disciplines are taught. The main objective of this project is to teach what is essential with a more practical and transversal approach. The APH was asked by the Ministry of Education to look into the history programs and change them where needed. Some of the outcomes of the project ‘Decisions & Dilemmas’ have been incorporated in that work. Finally, the participants looked back on the event very positively. The event even ended later than planned due to a high level of participation. This article is based on the report written by Miguel Monteiro de Barros from the Portuguese History Teachers’ Association.